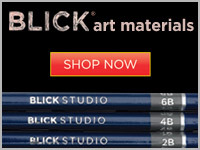 So, no surprise here, I get very excited when Halloween stuff comes out. Not just decorations, but clothing, too. So I splurge a little with the promise to myself that "it's just because of Halloween" and that I'm "stocking up" for other times of the year. If you're a store with exclusive Halloween pieces, you might want to email me because I am a sucker and will probably buy one of each. 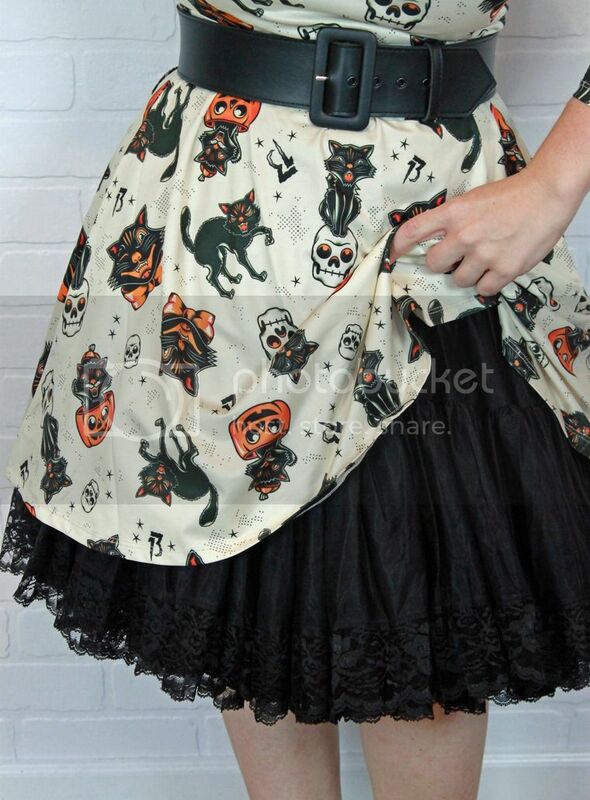 Anywhoo, this dress from Sourpuss Clothing is one of those things. 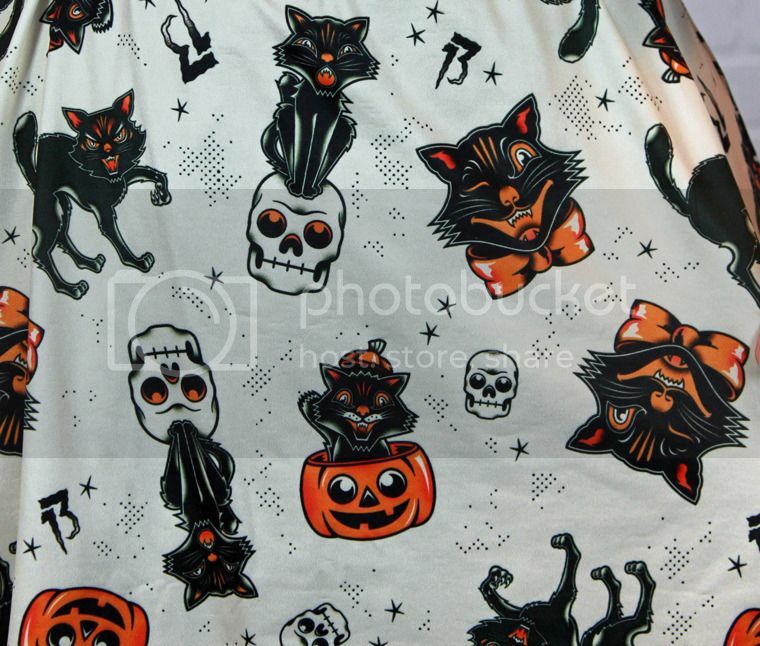 This Halloween print is AMAZING, and it was made into like three different styles of dresses, and I actually held back and only bought ONE version of it. Ha! It was the stretchy "skater" dress. Maybe it's because I'm so used to longer skirts now, but I was kind of surprised how short it was when I got it - keeping in mind that I'm like 5'1" - so if I think it's short, what about girls of average height and above? I used a trick that I'd seen on Miss Victory Violet's blog, where she often wears her petticoats peeking out from under her skirts (presumably to add length, or just a little ruffle trim), and decided to layer my black petticoat under my skater dress, just to see if it looked ok, and I was pretty pleased with the results! 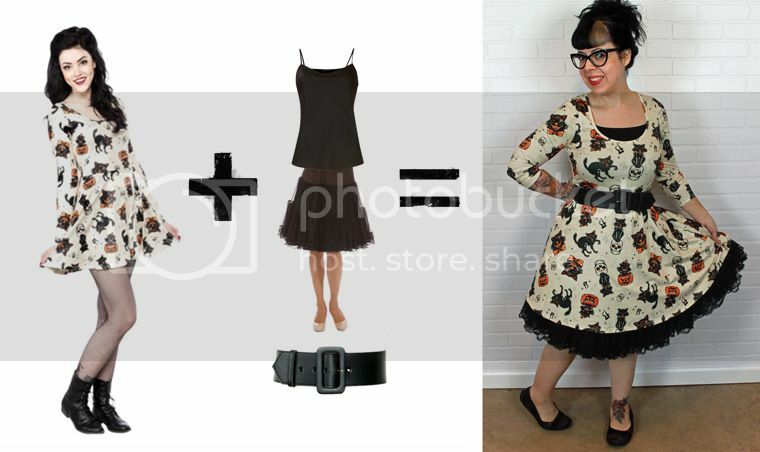 Above is the "formula" I used to turn my skater dress into a retro, fifties style of outfit. 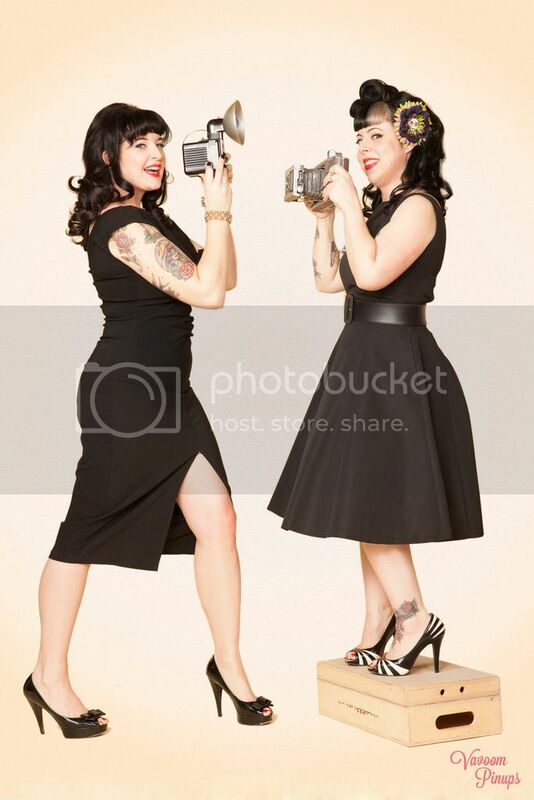 I wore a black camisole/tank and a black petticoat under the dress (it's a little too low cut to wear to work, so the tank does the trick to raise the neckline), and added a wide black belt on top to cinch and define the waist. I also like belts because they help break up an allover pattern that might otherwise be a little too overwhelming. I like the petticoats that are not as puffy/triangular as most of the ones that I find. Typically, it's the Malco Modes 580, or Zooey, style of petticoat, or the Sam's (I think it's the 500?) similar style. These petticoats are NOT the cheap-y $9.99 Leg Avenue or Amazon ones you might find... they typically run around $50, so I like to stalk eBay for deals on previously owned ones. Apparently they're very big in the square dance world... So far I have white, black, pink, and red. 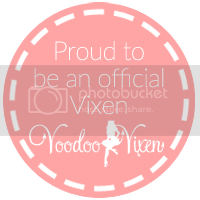 The other bonus of these petticoats is that they usually have an adjustable waistband that allows you to put the elastic in a higher/lower waistband "track" that shortens or lengthens the skirt an inch or two. You can probably guess that I wear mine in the shorty setting. Of course. 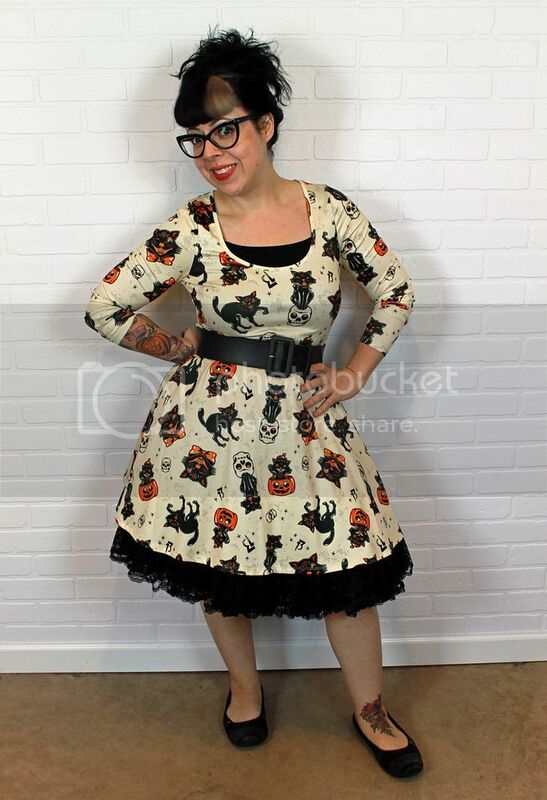 This vintage-inspired Halloween print was too cute to pass up, even though I typically would shy away from a mostly white dress (or especially beige-y... anything that is too close to my skin tone is weird in my opinion). 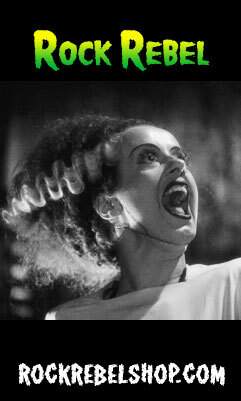 I get lots of people that ask me where I got it from. 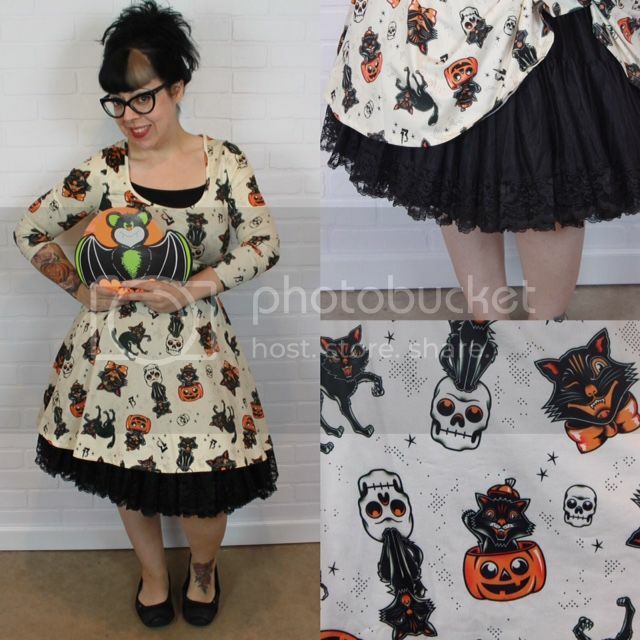 Even though the dress is Sourpuss brand, I've seen it at a few other stores online too, like Cats Like Us or Unique Vintage, so if you shop around you may just find it elsewhere in stock...! I know that it sold out pretty quickly this year, so I'm glad I snapped on it when I did. Soon I'll do a post on this year's Halloween decor at my house, but I've been scouring thrift stores for fun older (vintage-y) decorations, and came across this pack of old paper window decorations which seemed perfect as a photo prop. Dork city. My biggest claim to fame so far is that Sourpuss actually re-tweeted my instagram post of this OOTD, which was pretty cool because I was pretty proud of how I styled this one.